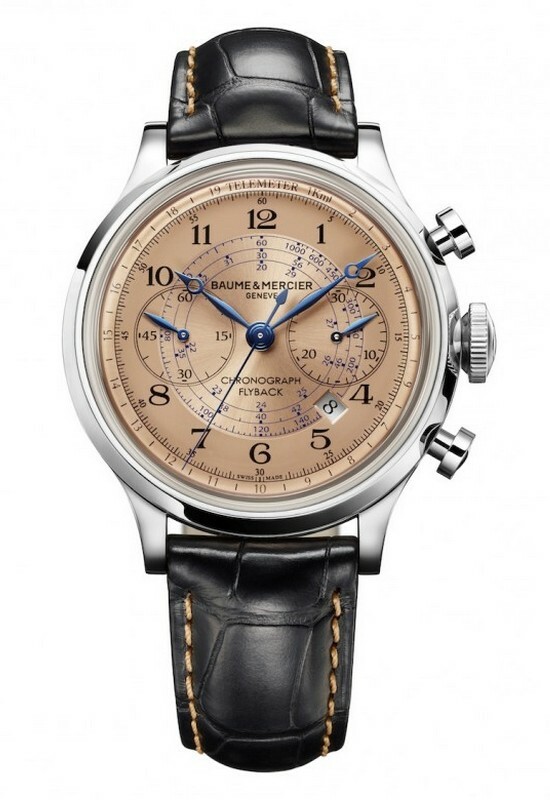 Baume & Mercier first introduced the Capeland collection, which houses their sportiest watches, in 1998. The watches in this collection are functional, trendy, and attractive. The brand has now released a new and limited edition Capeland that is exclusively available at Tourneau stores and for their US customers. There is only 250 pieces of this limited edition watch.The watch was originally had a dial that was either black or white. Now, this Capeland watch comes in a copper colored dial. The price for this US exclusive watch is estimated around $7900 US dollars. This Capeland timepiece comes in a 44 millimeters round case that is made of steel. The men’s watches also come in titanium cases. Covering the case is a domed shaped sapphire crystal. This domed shaped sapphire crystal is treated with an anti-reflective coating. Inside this case is the movement that powers this watch. The piece is powered by an automatic chronograph calibre made by La Joux-Perret. The calibre uses column-wheel construction to start, stop, and return the chronograph hand to zero. The column-wheel chronograph activation and flyback function are nice features and details of this watch. This La Joux-Perret Flyback chronograph can be seen through the sapphire crystal case back. 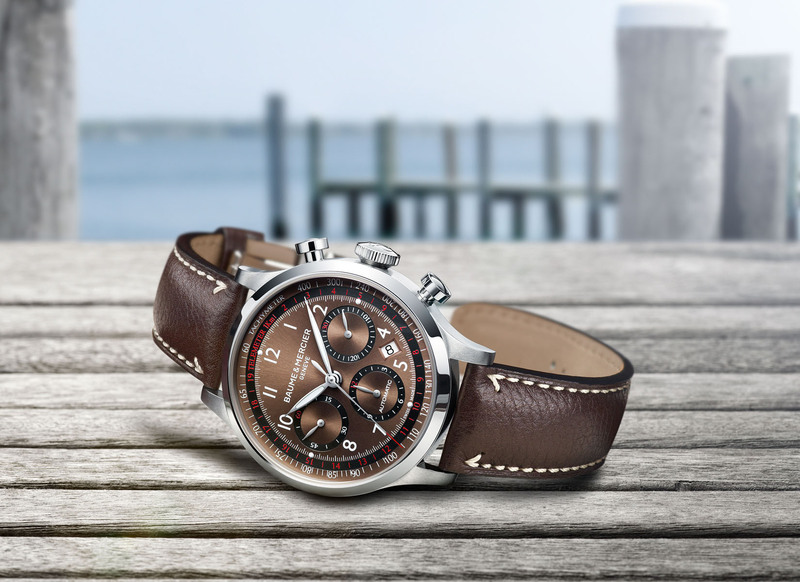 This precise and durable automatic flyback chronograph has a water resistance of up to 200 meters. 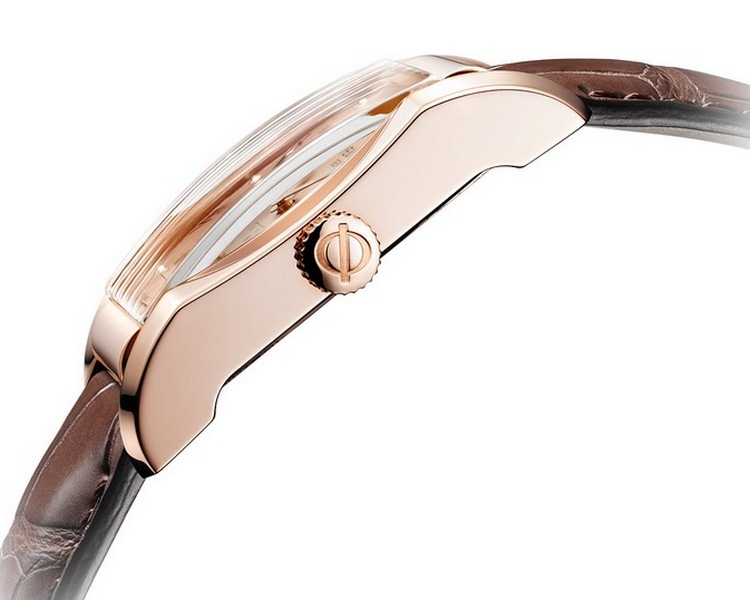 As mentioned above, the watch has copper-toned dial. Hints of blue can be seen throughout, including the overlapping tachymeter scale, counters, and the hour and minute hands. The Arabic numerals and telemeter scale are a nice contrast in black. 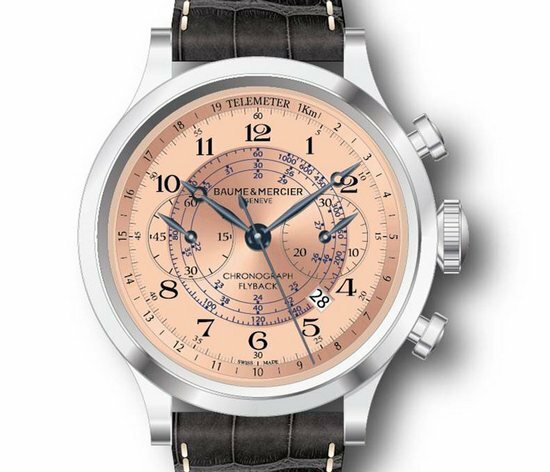 In addition to the two chronograph registers, there is also a date window between the 4 and 5 o’clock positions. The Men’s Capeland watches come in steel or titanium bracelets, as well as Kevlar straps. This sleek and sporty Baume & Mercier Capeland US exclusive limited watch is sporty and fashionable. This Capeland timepiece will be great addition to any wardrobe and will look great complementing a formal or casual look. Swiss luxury watchmakers Baume & Mercier released some brand new and some might say improved versions of their best-sellers, the Capeland Chronographs, to add their collection earlier this year. This time around, Baume& Mercier has changed the aesthetic of the Capeland Chronographs where you are now able to view their famous and magnificent automatic movements that are easily visible through the case backs encased in sapphire glass. With five different variations of this classic sports watch, there is sure to be something for everyone. Previously, Baume & Mercier released Capeland Chronogphrahs which were rather similar in appearance and function as the pieces in the previous collection with the subtle nautical themes and features as well as the easygoing nature of the watches. However, as mentioned beforehand one of the key changes that was incorporated into the watch was the skeleton case back in the newer versions display the automatic movements. 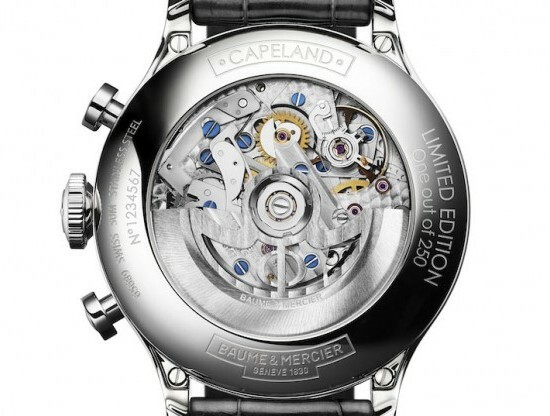 There are many other notable features of the newer Capeland Chronographs such as the round, stainless steel bezel and round case which are polished and measure 42 millimeters by 15.1 millimeters, lugs with a satin finish, chronograph, telemeter in red, date and grey-silver tachymeter marker functions and anti –glare, scratch resistant sapphire crystal. 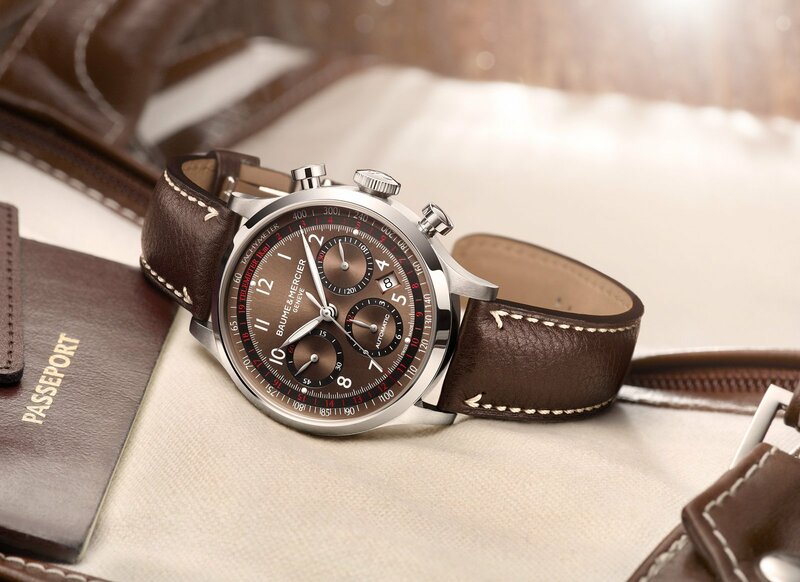 The Capeland Chronograph also comes equipped with many attractive features such as luminous, uniquely leaf-shaped hands, gorgeous sun satin-finished brown and copper-colored dial, white Arabic numerals and markers, brown calfskin leather strap with an adjustable, folding buckle and a screwed down crown. In addition to the features listed above, you can also expect to see a large central seconds hand counter, 30-minute subdial at 3 o’clock, 12 hour counter at 6 o’clock, a smaller running seconds clock at 9 o’clock, and at 4 o’clock a date window which all beautifully complement the bold brown dial. The watch contains 27 jewels that vibrate at a rate of 28,800 vibrations per hour, Valjoux/ETA 7753 calibre and a 48 hour power reserve. Baume & Mercier’s new additions to their already impressive Capeland Chronographs should provide many exciting and luxurious options to the modern watch collector or purely for a gift for a special man in your life. The Capeland Chronograph captures the spirit of the free spirited modern man in so many different ways by combining different colors, features and embellishments that each and every Capeland has its own unique personality. With so many variations, you just might have to buy more than one Capeland to suit different moods and activities. 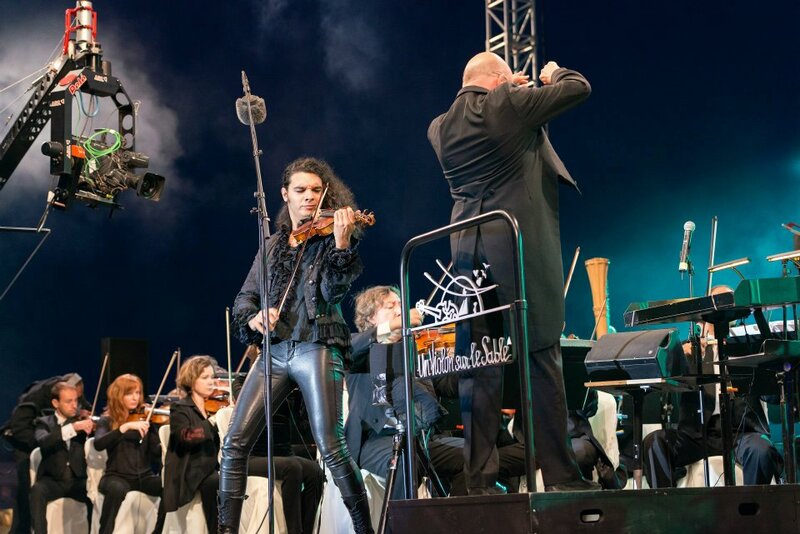 The Un Violon Sur Le Sable is a classical music festival that takes place annually in France at the stunning seaside resort at the Grande Conche of Royan which brings together throngs of people from all ages to enjoy an evening of music on the beach. The classical summer concert brings together the finest musicians, vocalists and performance artists from best performance art institutes in the world. Families and friends gather together for an evening of music and drama under the stars. Only a place such as the coastal resort in France could host such an enchanted gala which commands the finest artists in the world. To commemorate the festival itself and the gathering of these superior artists and performers, Baume & Mercier who is one of the music festivals sponsors, created an exclusive limited edition timepiece to mark the festival’s 25 years of music and magic. Of note, the event was actually named for Paris Opera violinist Patrice Mondon who received the very first Baume & Mercier Limited Edition Un Violon Sur LeSable watch. This limited edition collection of Baume & Mercier Un Violon Sur Le Sable watches are restricted to only 25 pieces. 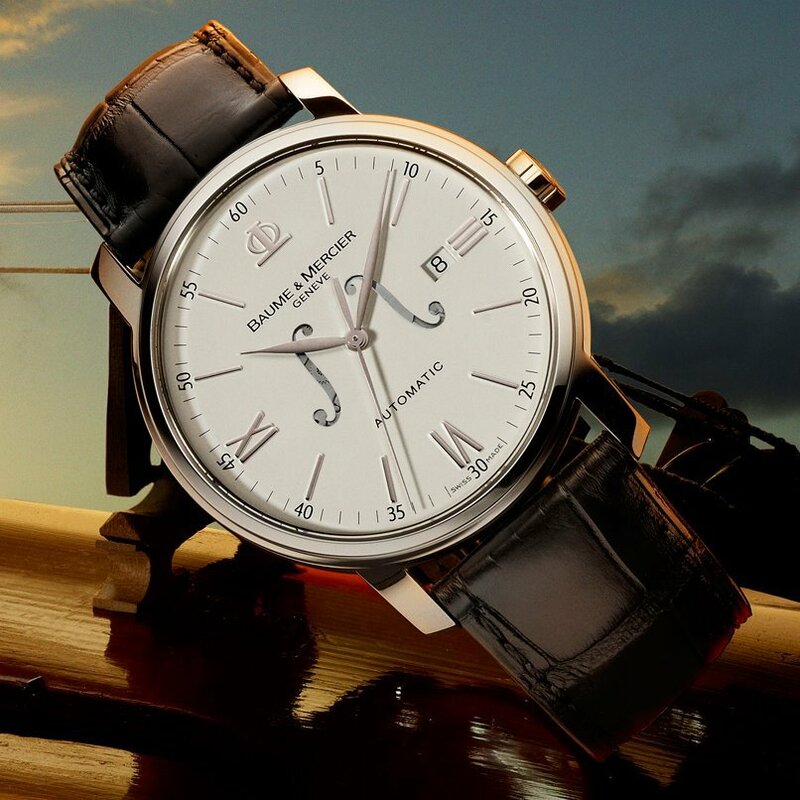 The Baume & Mercier Limited Edition Un Violon Sur Le Sable watch features dazzling curved violin sound cavities on the dial which pays tribute to music. The simple but chic dial also bears distinct black Roman Numbers and index markers. The sound holes of the violin also allow you to get a glimpse of the automatic movement of the watch. The steel case of this classic timepiece measures 42 millimeters, has a date display and the case back is engraved with the festival emblem as well as “25eme anniversaire” in French. This splendid watch is attached to a chic black alligator strap which is patterned with exclusively four-sided scales and a superbly inscribed crown bearing the infamous Baume & Mercier Phi emblem. Although this timepiece was created with the Un Violon Sur Le Sable in mind, this watch would be a fine timepiece for any music lover, musician or attendee of the famous event to own and admire. The timepiece evokes a very subtle interpretation of class, luxury and timelessness with its delicate features and design. The Baume & Mercier limited edition Un Violon Sur Le Sable is the quintessential embodiment of modest luxury which would make for a marvelous accessory for any music lover or a watch collector. Swiss luxury watch manufacturer Baume & Mercier have a very long history of creating luxurious timekeepers and have blazed the trail for combining striking designs and innovative technologies. 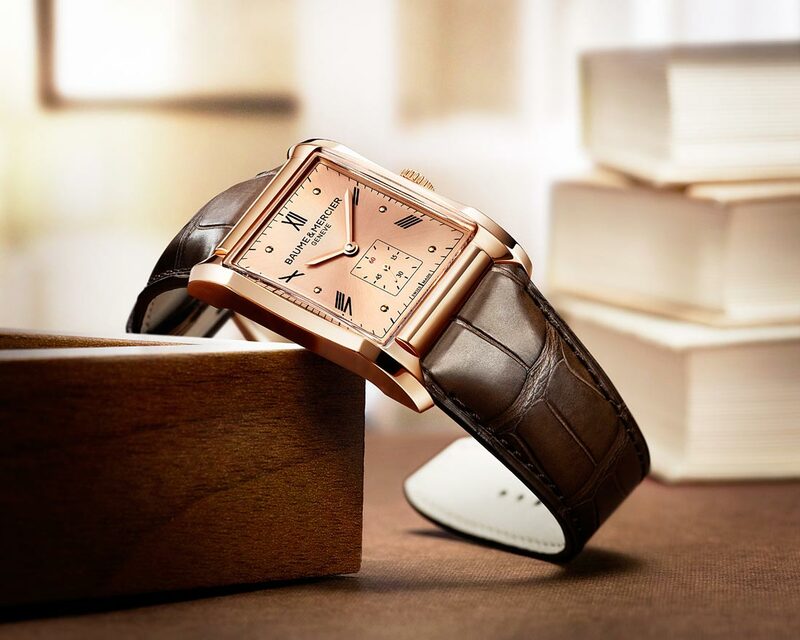 Baume & Mercier has always abided by their values of remaining loyal to their heritage, being confident of their knowledge and being a symbol of affordable indulgence. Baume & Mercier prides themselves on helping to create special moments in the lives of individuals who wear their classic timepieces. One of their recent releases is the Hampton Small Seconds Watch in Rose Gold which is a gorgeous unisex timepiece with a sleek rectangular case featuring elegant vintage touches and modern glamour. Avid watch collectors might look at the Baume & Mercier Hampton Small Seconds Watch and it will spark up sentiments of the Jaeger Lacoultre design. Both timepiece share the rectangular case attached to an alligator strap. 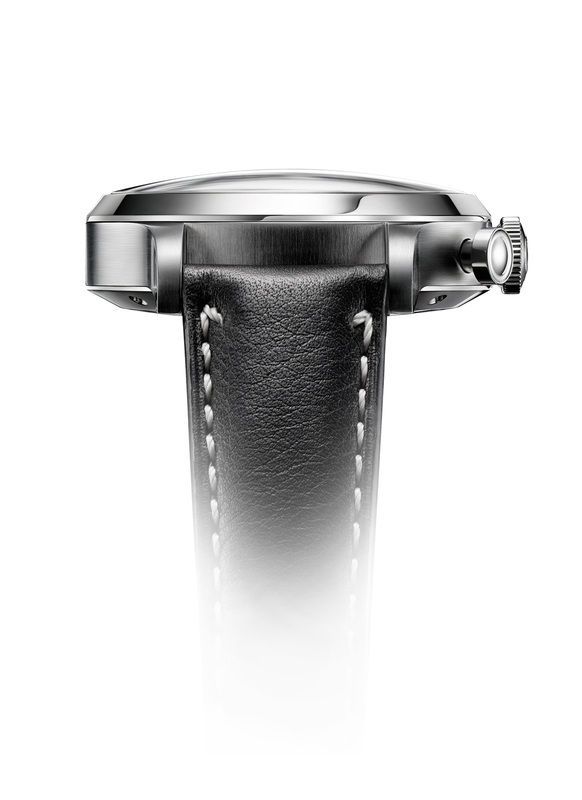 The Baume & Mercier Hampton 10033 has a particularly slim body measuring 45.5 millimeters by 30 millimeters and 10.65 millimeters in width, a screw-down crown emblazoned with Greek lettering on the tip which represents balance and perfection. This particular watch from the Hampton collection is said to be quite distinctive from the remainder of the watches in the collection with its hand wound movement, a slender La Joux-Perret ebauche caliber 736-3, 21 jewels that pulses at 21,600 vibrations per hour. 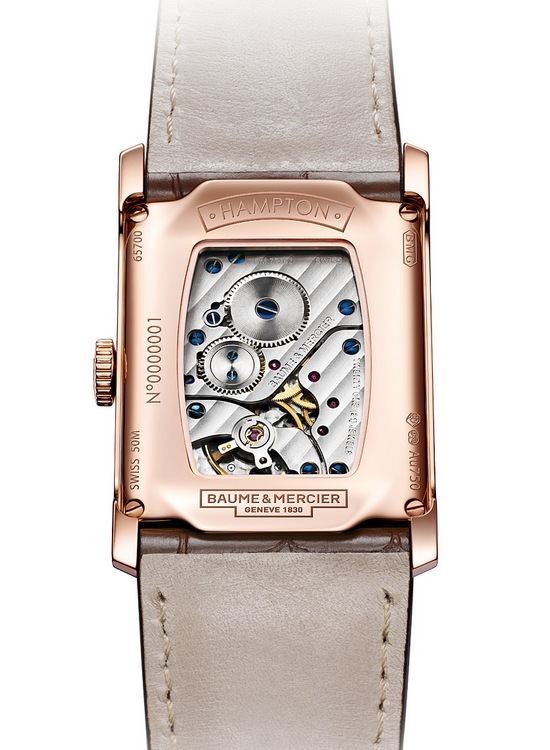 The Hampton 10033 also features a sapphire glass casing, case back made of sapphire crystal which lends itself to displaying the blued screws and Cotes de Geneve stripes that curve transversely at an angle. Perhaps the most striking feature of this watch is the rose gold dial and hands that offer a look of fluidity and glamour. The rose gold dial contrasts nicely with the black markers, Roman Numerals, gold raised buttons and impression of the Baume & Mercier brand name. An almost inconspicuous characteristic of the dial is the petite seconds counter located at 6 o’clock but offers no contrast to the rest of the dial being the same color. 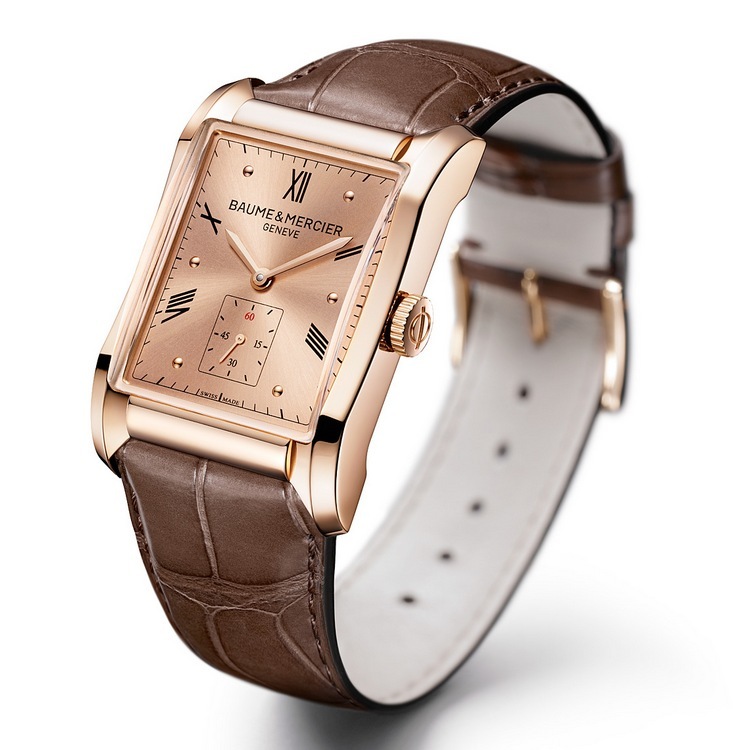 The distinctive rose gold case is attached to an attractive brown alligator strap with a pin buckle. 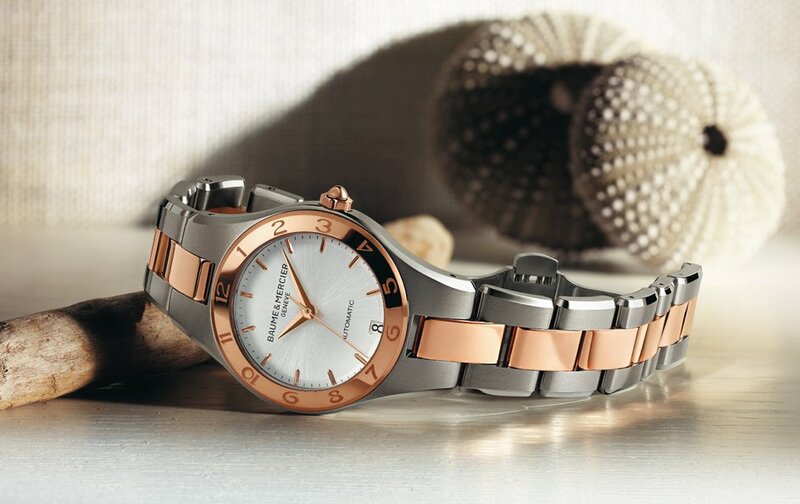 Baume & Mercier does not offer variations of this timepiece at the moment. Holding a power reserve of 42 hours and is water resistant to 165 feet, the Hampton 10033 can easily be worn for both work and play with ease. One could easily transition this watch from the office to dinner to a weekend out on the town. Want the best of both worlds? You’ll know just from watching the Olympics that the best things in life are often a mix between grace and strength, between innovation and standards. This goes double for watches. Fortunately, there’s the Baume & Mercier Two-Tone Linea Automatic 10073 Watch for those who know that mixing and matching is the best combo. Part of the Linea line, the Baume & Mercier Automatic is a slightly different take on one of their best designs. The most eye-catching element of the watch is the masterful combination of 18 k red gold and stainless steel on the wristband and bezel. The Baume & Mercier have been a favorite with ladies since the early 1950s, but their classic design still hasn’t gone out of style. Over sixty years later, this watch remains a timeless classic. The blend of strong and subtle elements creates a light symmetry that deceptively difficult to achieve. The practicality of the stainless steel band juxtaposed against the soft gold blends together seamlessly in this piece. A more modern element of the piece includes the open back of the watch, allowing you to look in on the movement of the watch behind a sapphire crystal window. With a bright, open face and clearly marked gold indices, the watch is readable, wearable, and lovable. The fixed steel bezel has numbers etched into it, adding a subtle element that makes the watch just that much easier to read. The satin finish on the watch blends all of the elements together by adding a soft glow to the piece. It can sometimes be difficult to mesh silver and gold tastefully, but the stain sheen binds the elements together to create an irresistible timepiece. Water resistant up to 50 m/165 ft with minutes, hours, seconds, and date function, this watch is practically perfect in every way. The automatic movement, anti-reflective sapphire crystal dial window and triple-folding clasp adds extra security to a quality watch. Choose from the ETA 2892-A2 or Sellita SW300 movements to keep your watch ticking. Both versions boast 21 jewels and 42 hours of power reserve. Either way, this watch will keep time with everything you do—and then some. 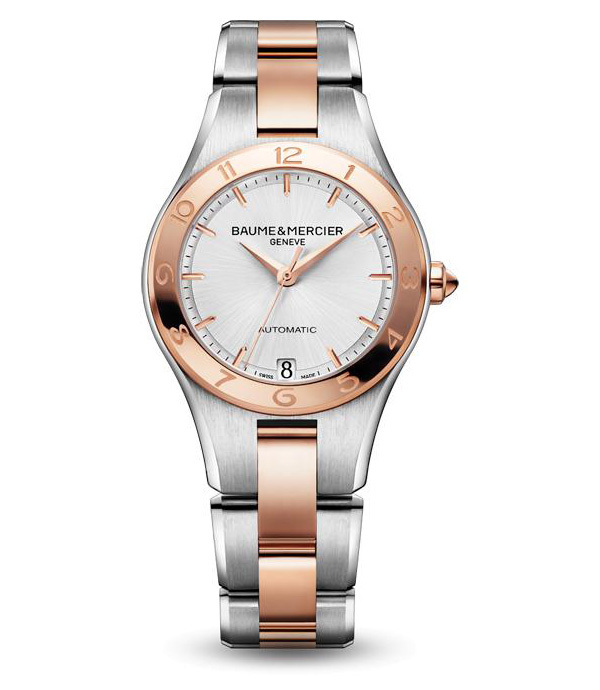 Easy on the eyes and in every other aspect, the Baume & Mercier Two-Tone Linea Automatic 10073 Watch combines all the elements of classic ladies watches and takes it two steps further.